Aussie Open Men’s Final: What a cracker of a match! Honestly speaking, I thought it was Nadal’s 11th. To think that you could beat the greatest retriever of the ball ever in the history of tennis in a five-setter that dragged on for nearly six hours is sheer audacity. More so after you go out of breath in the decider, go down a break and break back Nadal and break him again and serve out the for the championship! That’s crazy! What a cracker of a match from these two great champions! To call it an “epic” would be an understatement and in fact, inappropriate as this word gets thrown around after almost every tennis match that drags on for over four hours. The stroke-making, the defence from Rafael Nadal and the attacking tactics from Nole set such high standards that it will be difficult for any other player/s to come close to it. I am not sure if there will ever be an action replay from the same two guys. It is impossible to keep on playing at this level. The sheer physical strain each player put his opponent through was excruciating. Yet, there wasn’t a moment of boredom. 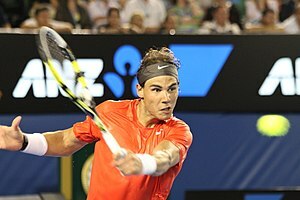 It was all about being awed by Nadal’s retrieving tactics and some attacking strokes with his inside-out forehand. It was all about being dumbstruck by Nole who egged himself on each time the momentum began to shift in Nadal’s favour. He kept pushing the Spaniard behind the baseline and made many winners out of service returns. I am not sure if there will be one more such finals. Not one for many more years to come, at least. This entry was posted in Racquet Science and tagged Australian Open Final, Novak Djokovic, Rafael Nadal. Bookmark the permalink.